You’ve made it through the first hour or two and you will find yourself moving out of the early stages of the tournament and into the middle stage. You will have to judge when that transition happens as it will be different in every tournament depending on the number of entrants and the blind structure. In general you will be able to tell as the blinds are starting to get quite high compared to the short stacks and those that have not managed to increase their chip stack and keep it in line with the average stack will start to be in a critical position. So the question is, how should you continue to play, should you change the way you have played in the early stage? Well the answer is maybe, maybe not! The problem with trying to define play in poker is that there are so many variables and so many different situations that in a guide like this it’s only possible to generalise on the type of play to make and the possible outcomes. There is no substitute for experience. The first thing to do is to assess your position in the tournament. What stack do you hold? How does this compare to the average stack? How much time have I got? A key figure to understand is how many orbits your stack holds, which tells you how many orbits around the table (time it takes the dealer button to move back to the same player) you could just sit there and not play a hand before you ran out of chips. This combined with the average stack will give you a good indication of your situation in the tournament and whether you need to shift gears in the way you play and your middle stage strategy. The whole philosophy that underpins our middle stage strategy is that we want to be patient, just like we were in the early stage, but we do not want to just sit there and let our chip stack reduce to the point where we have no fold equity left. Fold equity like we talked about early is when you are the aggressor in the hand and by making a bet or raise it gives you a second way to win the hand not just by holding the best hand at a showdown, but also with the chance that your opponent may fold from the bet or raise. 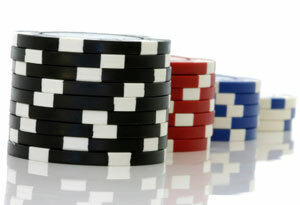 If you let your chip stack get too low then this fold equity reduces or disappears completely as your bet or raise would now be so small compared to your opponents stacks that there is more chance that someone will call. So we want to monitor and recognise when we are approaching being a short stack and then change gears in the middle stage. We would take more risk in order to try and avoid getting to the short stack, mission critical stage where we have very minimal fold equity. In this section we will look at calculating and monitoring key indicators of your situation in the tournament and then how to change gears if it is required. We will also introduce some more strategy topics such as the Gap concept which comes much more into play in the middle to late stages of a tournament.